Yesterday was Father’s Day. The kids, alas, live too far away to celebrate it with us, but Clif and I are firm believers in celebrations big and small. 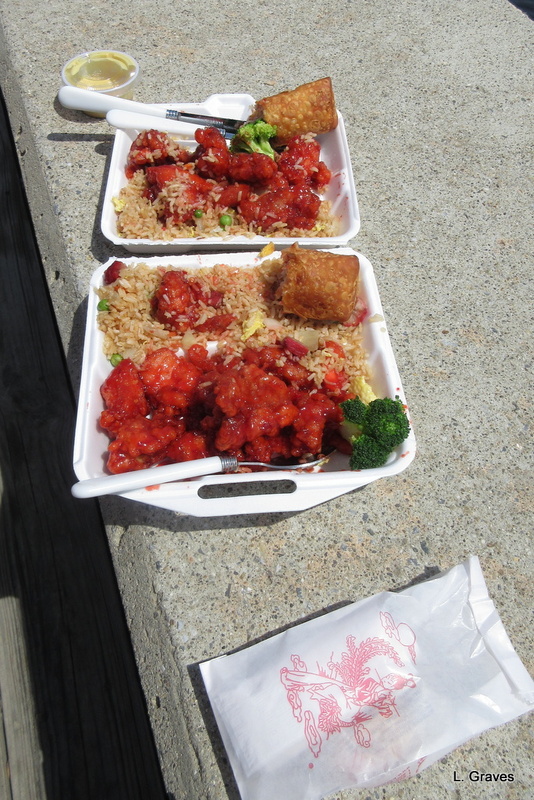 Therefore, to mark the day, we decided to go to Hallowell, a tiny city on the Kennebec River, order Chinese food, sit by the river, and then go for a bike ride along the rail trail. 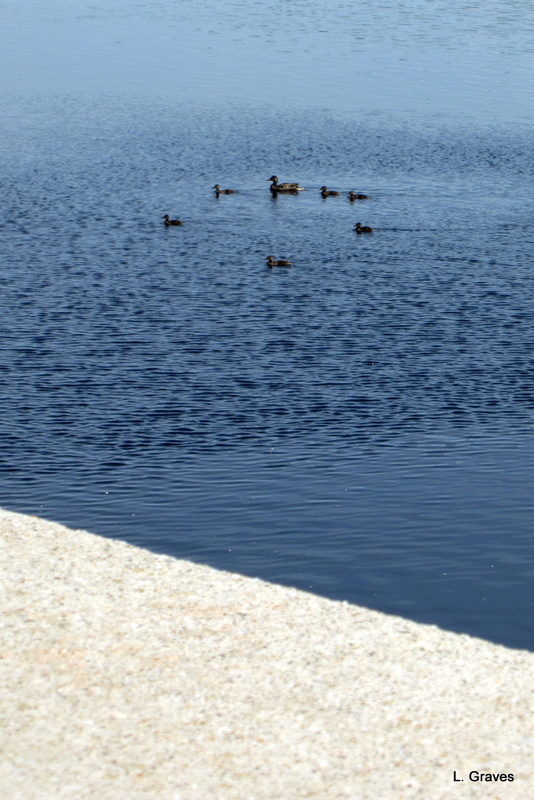 While we ate on the pier, we admired a mother duck and her ducklings. And we watched a woman in a kayak go by with her dog. What a good buddy to stay put! I saw a sturgeon jump, straight up and then back down with a splash, but I wasn’t at the ready with my camera. Darn! Dealing bravely with this disappointment, we took to the rail trail. While we didn’t see any more sturgeon, we did see this beauty. 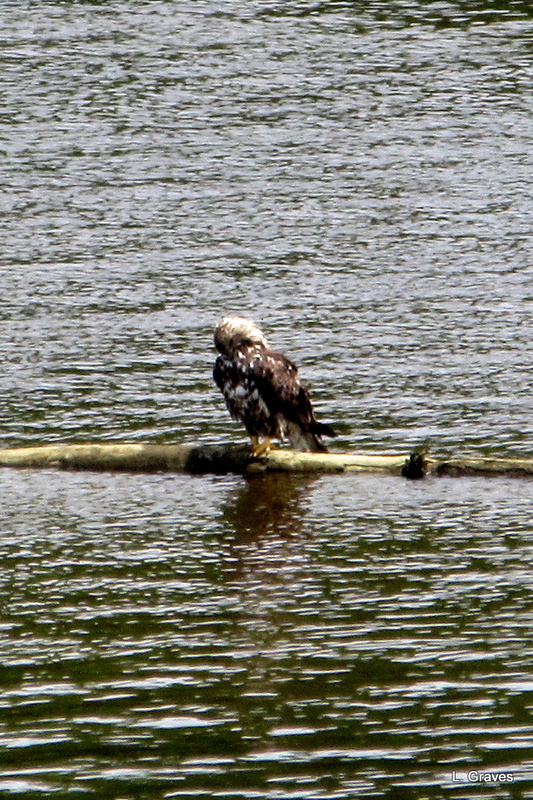 I am pretty sure it is a young bald eagle, but if any of my birding, blogging friends think differently, do let me know. So wonderful to see the river full of life, especially as my childhood memory of the Kennebec River is of it being dark and dirty with no fish or birds. (I’m sure there were some, but back then nobody I knew spent their days by the Kennebec River.) What a difference the Clean Water Act has made, and I am very grateful for the lawmakers who worked together to clean our polluted waterways. After the ride, we were more than a little hot. What to do? 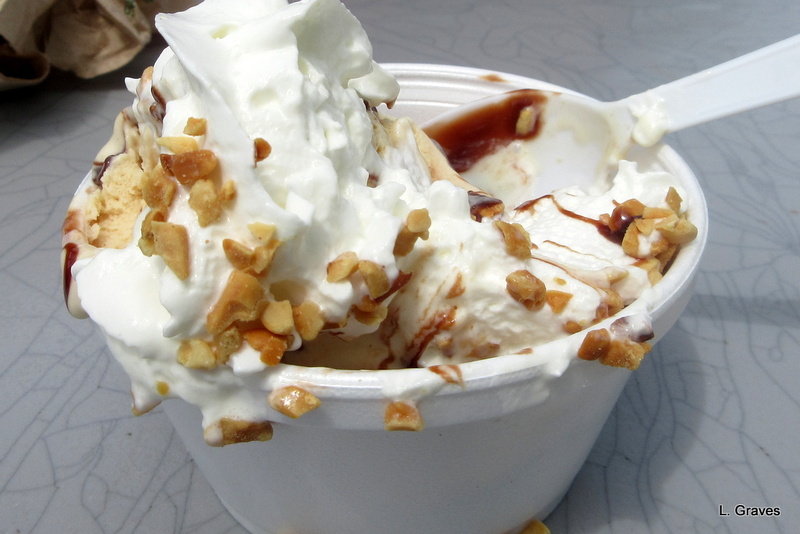 Go for ice cream, of course, at Fielder’s Choice, where we shared a hot fudge sundae with peanut butter ice cream. Thanks so much! The Kennebec River fills me with hope in a time that isn’t offering much. We can not only curb our destructive ways but also restore a damaged ecosystem. In 1962, bald eagles were nearly extinct. Now, they are no longer on the endangered species list. So heartening to witness that life will rebound, if given a chance. The Kennebec River and bald eagles are a powerful reminder of this. Happy Father’s Day, Dad!!! 🙂 Sounds like a perfect way to celebrate it!! Summer is upon us – a great celebratory start! Such a sweet time of year. Thank you for sharing your day with us and how wonderful to be reminded that regulations like the clean water act can make such a difference! I live where it was so smoggy all summer long we could never see the mountains that surround us and now because of the clean air act they are usually visible! A downer is our president is trying to roll back our emissions laws but Govenor Brown isn’t backing down. Another success story. Sometimes, things must come from the top down for there to be lasting effect. How wonderful you can see the mountains. Oh, that president! Go, Governor Brown! Sounds and looks from the photographs like a most enjoyable day. A very good ending to a good day (apart from the inconsiderate fish). What a lovely day! A celebration from start to finish! The food looks yummy! (I am on a diet, can’t you tell?) I loved the pictures of the duck and ducklings, the bald eagle and the good dog in the kayak. I like the idea of always being ready and willing to celebrate an occasion. Usually in small ways, but always fun. Such a perfect day!! 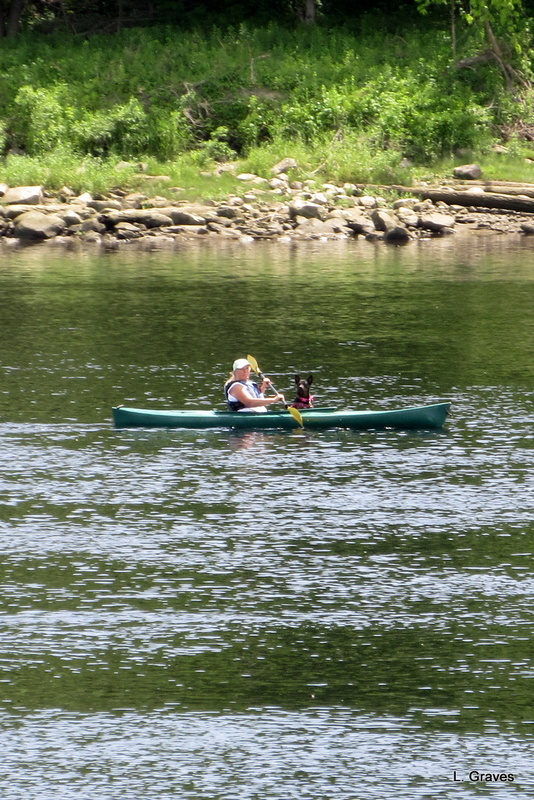 I love the kayaking dog–my mom used to take her Siamese cat out in the canoe with her . . .
Wow! A Siamese cat. Even more impressive than a dog. I’m glad you both had a great Father’s Day. Wonderful to see the young eagle – I always look for them in the US but don’t spot one very often. We’ve agreed a word for something that I think looks like an eagle, but is probably not one – a neagle. Whether yours is an eagle or a neagle, something that big and beautiful has got to be celebrated. 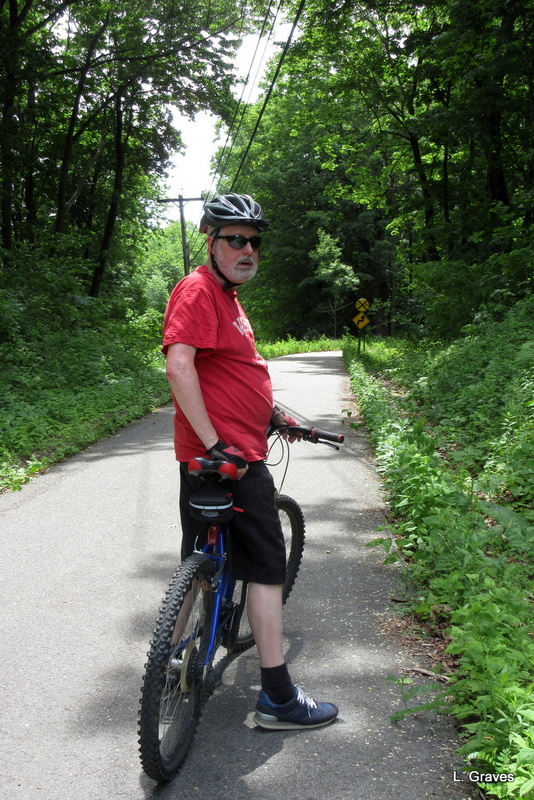 Sounds like a wonderful day with good food, communing with the natural world, and getting some exercise on the beautiful rail trail.Happy Father’s Day, Clif. Sounds like a fine day. We are lucky that our older son lives here in Chicago. He came over and cooked us a dinner of beef stroganoff. Sounds wonderful! And, yes, it is always better to have the children nearby. Going out for ice cream is always grand. In Scotland they have tourist eagles – a combination of buzzard and wishfull thinking. This far south we just have buzzards.